Sometimes it is necessary to add additional configuration options to the PDF processing configuration in the Pimcore backend UI - for example when creating PDF/X conform PDFs with PDF Reactor. But also for other use cases, it might be necessary to hook into the PDF creation process and modify the configuration before creating the file. 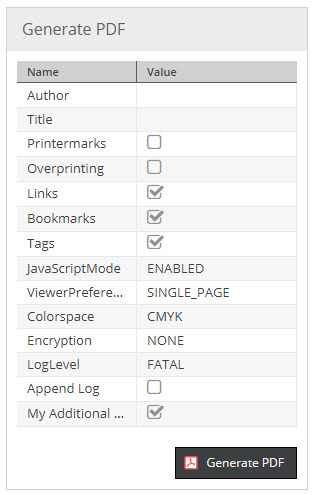 PRINT_MODIFY_PROCESSING_OPTIONS: Event to modify the processing options displayed in the Pimcore backend UI. For example add additional options like AppendLog and My Additional ... in the screenshot above. PRINT_MODIFY_PROCESSING_CONFIG Event to modify the configuration for the PDF processor when the PDF gets created. For example read values for additional options and apply these values to the configuration of the PDF processor accordingly or do some other stuff. Services in Container see above.